The Winery Dogs are taking all of next year off to focus on their own individual projects, drummer Mike Portnoy confirms. 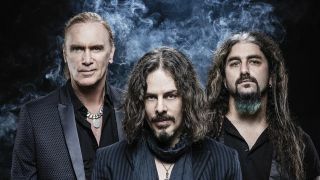 The trio featuring the former Dream Theater drummer, along with Mr Big men Billy Sheehan and Richie Kotzen, recently wrapped up their tour in support of their second album Hot Streak. Portnoy tells Eddie Trunk on Sirius XM (via Blabbermouth): “We’re basically going to take 2017 off. Richie’s going to do his solo band stuff, and I think Billy says he might be doing some Mr Big activity. “I’m going to spend 2017 with The Neal Morse Band for the first several months, then possibly a new Flying Colors album and a new Metal Allegiance album. In summer, Portnoy said he’d play the Twelve-Step Suite on his 50th birthday Cruise To The Edge which sets sail from Tampa, Florida, on February 7, and he later confirmed he’ll also perform the set at Atlanta’s ProgPower event in Georgia on the weekend September 8-9 next year. Now he says he’ll take the show to further events and festivals under the banner Shattered Fortress throughout next year. Portnoy also confirms he’s putting the finishing touches on a live release package for The Winery Dogs which was recorded in Santiago, Chile, which is due to launch in early 2017. Further release details will be revealed in due course. Portnoy and The Neal Morse Band will release album The Similitude Of A Dream on November 11.